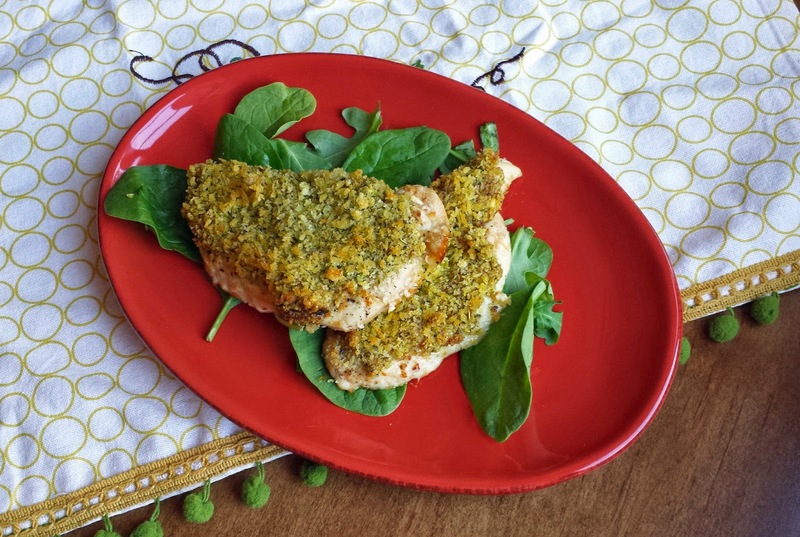 Pistachio Pesto Breaded Chicken, it’s not a glamorous name. I struggle in naming dishes at times, I want to give them fabulous names, but then y’all wouldn’t know what the heck I was talking about! I kind of like “Pollo di Pistacchio”, which is Italian for pistachio chicken…I think…don’t quote me on that! I love that the word for chicken “pollo” is spelled the same in both Italian and in Spanish; that makes one less word in this world that I have to memorize! In German chicken is “Hähnchen”, I don’t know if I ever would have learned how to say “Hähnchen” if it hadn’t been for my friend Heidi; I mean look at all those consonants. In fact, I wouldn’t have been totally lost the first year that I lived in Cologne if it hadn’t been for Heidi. Did you know that I lived in Germany? It’s all there in the “about me” section. Any hoo, this so simple to make, and it is super flavorful thanks to Pistachio Pesto. When I made Butternut Squash Penne with Pistachio Pesto, I made extra pesto just cuz I knew that I’d want to eat it more than once. Boneless skinless chicken breasts run the risk of getting dried out before the chicken is cooked through, pounding the chicken to an even thickness will help the chicken to cook more evenly, resulting in juicy chicken. Season both sides of the chicken with salt & pepper, and then spread a heaping tablespoon of Pistachio Pesto on the top side. Pretty much any other kind of pesto would be great, just as long as it’s made a little bit on the thick side, so that it won’t run off of the chicken. Sprinkle a good amount of seasoned panko bread crumbs over the pesto, and press it down just slightly so that the crumbs will hold in place. Spray the bread crumbs with a little oil. If you don’t have a mister, you could use cooking spray. Cook that chicken in a 400 degree oven for 20 to 25 minutes. There you have it! 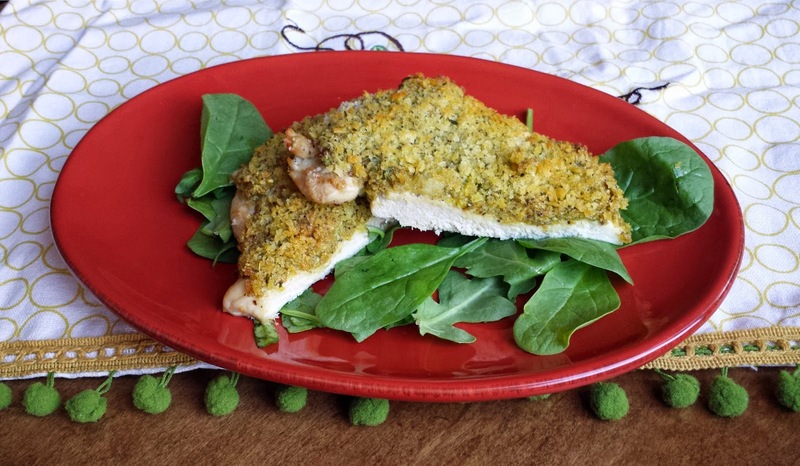 Pistachio Pesto Breaded Chicken, the name may not be fabulous, but the flavor is! 2. In a small bowl combine the panko bread crumbs with Herbs de Provence (or Italian seasoning), and a pinch of salt & pepper. Set to the side. 3. Pound the chicken breasts just so that they are an even thickness. Season both sides of the chicken with salt and pepper. Spread 1 ½ Tbsp. 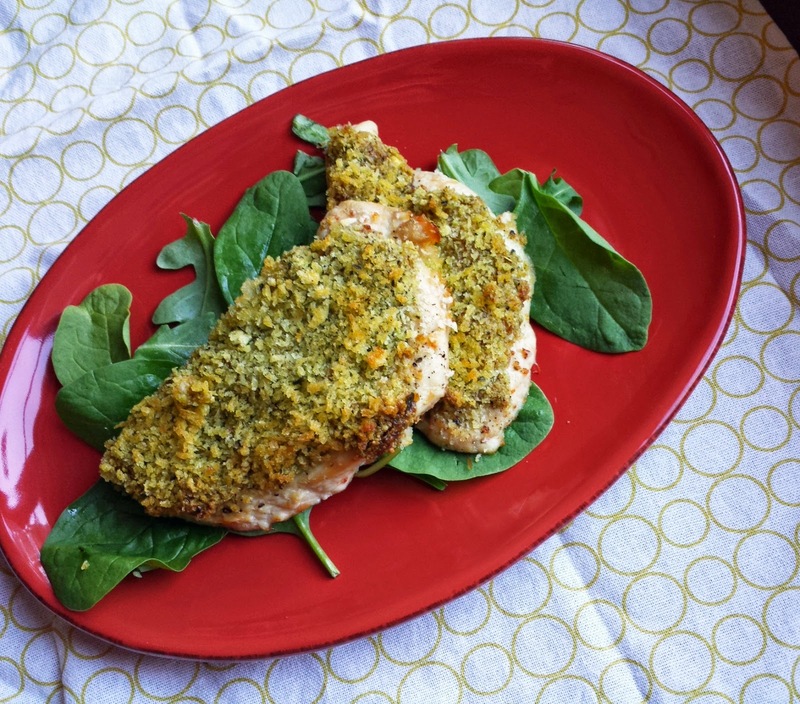 of Pistachio pesto on the top side of each chicken breast, and sprinkle 1 ½ Tbsp. of the seasoned bread over the pesto, press it down just slightly. Spray the top of the bread crumbs with oil from a mister, or with cooking spray. Cook in the hot oven for 20 to 25 minutes, until the chicken is cooked through. That pistachio pesto crust looks so good! This dish would rock! Nice. I really like the addition of the pistachio. Pistaccio pesto crust sounds like a wonderful kitchen creation and the color is beautiful too!